The volume is divided into four sections: typology, syntax, discourse and phonology. Two of the typology papers study the structure and organization of category systems (Joseph Greenberg, Linda Schwartz); the third discusses language typology and universals from the perspective of language acquisition (Fred Eckman). The eight papers in the syntax section are of three types. Edith Moravcsik and James Tai discuss 'general' issues of linguistic theory/domain. 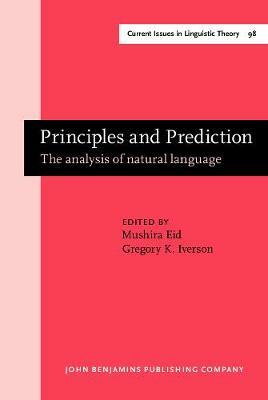 Four papers (Mushira Eid, Michael Kac, Nancy Hedberg, Larry Hutchinson) address specific analyses and their implications from language-particular and theoretical perspectives. The papers by Deborah Dahl and Thomas Rindflesch relate theoretical concepts and analyses to natural language processing. In the section on discourse, the contributions by Anita Barry and Amy Sheldon deal with interpersonal conflict; George Yule discusses the selection between direct and indirect speech forms. Helga Delisle and Cynthia Clamons consider ways in which choices among, or variation in, some grammatical and semantic categories may be explainable on pragmatic and discourse grounds. The phonology papers are focused on two major themes: underspecification and borrowing. Four of the articles address the issue of underspecification in phonological representations (Daniel Dinnsen, Joseph Stemberger, Janet Bing, Gregory Iverson). In the other two papers questions of borrowing are discussed, in Nancy Stenson's contribution from a synchronic perspective, and in Gunter Schaarsmidt's paper from a historical one. The volume is completed by a subject index and a language index.